◎Updating Ambidextrous Design: Can Be Rotated for Left or Right Hand Draw. Left or right to fit your carry preference. ◎With Strong Snap Button: Retention Strap Uses A Snap Button, Instead of Velcro for A Silent Drawn and Quick Release. ◎Extra Movable Pouch: This extra pouch is completely removable and can be placed anywhere on the band. Move it to the rear to secure and hide that cash or extra weapon! You can wear it in almost every situation! Whether you dress up for the office or go to the gym, The Belly Band can be there, totally concealed and ready! Made by neoprene,it won't pinch your skin or pull your body hairs, and is comfortable against your skin. 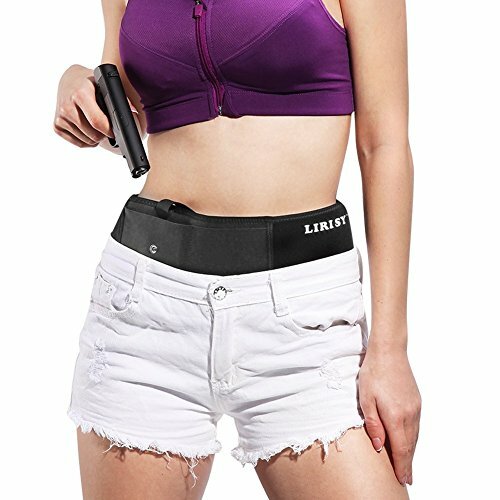 The Lirisy belly band holster measures 5 inch wide x 42 inch long and will comfortably fit a 45" diameter. To ensure a comfortable fit simply use a tape measure and measure the area you intend to carry. Handgun size: Overall length supported: 4" - 8". To ensure handgun fits, measure the length from the tip of the muzzle to the curve in the grip. Fits most handguns such as Glock 17, 19, 42, 43, Sig Sauer, Beretta, Springfield, M&P Shield, Ruger, Taurus, Kahr, Kimber, Kel Tec, Bersa, Walther, S&W, 380, 40 Auto, 38 special, 45 ACP, 357, 9mm, 10mm etc. If you have any questions about this product by LIRISY, contact us by completing and submitting the form below. If you are looking for a specif part number, please include it with your message.